Double Take 'Toons: Exchange Ratings? October 23, 2011  Israel swapped over 1,000 prisoners for Gilad Shilat an Israeli soldier held by Hamas. Neither Steve Greenberg nor Signe Wilkinson think either side is really better off. 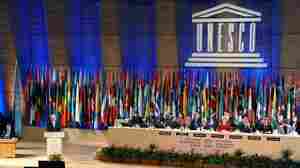 October 21, 2011  People the world over are rejoicing in Libya's new freedom. But many are wondering, who will be the next dictator to fall? The New Republic's Martin Peretz reflects on Moammar Gadhafi's death. October 19, 2011  Unusual behind-the-scenes negotiations led to the release of Israeli soldier Gilad Shalit and hundreds of Hamas members this week. Robert Siegel speaks with Patrick Martin, The Globe and Mail's Middle East correspondent, about the peace activist and the professor who got things going. Amoz Oz was born in Jerusalem in 1939. He is the author of To Know a Woman, Don't Call It Night and A Tale of Love and Darkness. 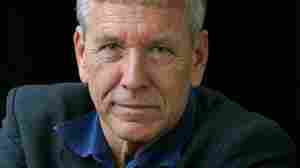 October 19, 2011  Israeli writer Amos Oz rarely settles for a happy ending. His latest book, Scenes from Village Life, doesn't have one and, according to Oz, neither does the recent release of Israeli soldier Gilad Shalit. October 19, 2011  Images of a pale and clearly shaken Gilad Shalit dominate Israeli television screens, as the country celebrates his release after five years in captivity. The Israeli soldier was released from Hamas captivity on Tuesday. October 19, 2011  Palestinians have been celebrating the release of nearly 500 prisoners in an exchange with Israel that freed Israeli soldier Gilad Shalit. It will be weeks before the second phase of the prisoner exchange takes place. Washington has offered a new meeting of the Mideast Quartet as a sign peacekeeping efforts are still alive, but few expect progress. October 18, 2011  Osama Hamdan said the negotiations prove that Hamas is "rational," in that they were able to come to common ground with Israel. 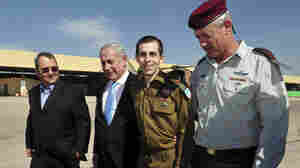 Released Israeli soldier Gilad Shalit (second from right), walks with Israeli Defense Minster Ehud Barak (left), Prime Minister Benjamin Netanyahu (second from left) and Israeli Chief of Staff Lt. Gen. Benny Gantz, at the Tel Nof Air base in southern Israel on Tuesday. Shalit was freed after more than five years of captivity in the Gaza Strip. October 18, 2011  Gilad Shalit's captivity had been a wrenching issue for Israel for more than five years. On Tuesday, Shalit was freed from the Gaza Strip and returned home, and in turn, Israel released nearly 500 imprisoned Palestinians. October 18, 2011  The Palestinian group Hamas was feted Tuesday in the Gaza Strip for having secured an agreement from the Israelis to free more than a thousand Palestinian prisoners in exchange for one Israeli soldier, Gilad Shalit. Shalit was captured in a cross-border raid more than five years ago. Nearly half of those Palestinian prisoners were released Tuesday, and those remaining are slated for release in two months. Osama Hamdan, a senior official from the Hamas international relations department, tells Robert Siegel the move is a victory not only for Hamas, but for all Palestinians. October 18, 2011  Five years after he was captured by Hamas militants in Gaza in a cross-border raid, Israeli soldier Gilad Shalit was returned to his home country. Michael Oren, Israeli ambassador to the U.S., talks with Robert Siegel about the deal that will free more than one thousand Palestinian prisoners from Israeli jails in exchange for Shalit's release Tuesday. 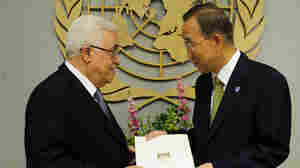 October 18, 2011  It's been a day of celebration in the West Bank and the Gaza Strip. That's after 477 Palestinian prisoners were released in the first phase of the exchange that also freed Israeli soldier Gilad Shalit.